The Macs: 2009 or 2010? Praying for you all through the happy and the sad. Your faith throughout this journey has been an inspiration to myself as well as others. Looking forward to meeting Baby Mac - whenever he/she decides to make an appearance! Beautifully written, Jess. Your words are so honest and tue! Can't wait to hear the news of Baby Mac's arrival! We pray you have a safe, easy delivery! Baby Mac is coming into the most wonderful family. He/she will be truly blessed to call you and Joel mommy and daddy! Take care!! I have been reading your blog , since about a month before Cora became really sick but have never commented before. You & your husband are amazing people ! And your blog has touched my heart , over & over again, in so many ways. I am praying that everything goes smoothly for you both & this new little one. I know Cora will forever be in all our hearts & she is always watching over you. I admire you & your husband so much. This old world needs more human beings , like you. I admire your strength and will be praying for you and your friends the Johnsons! You both are such amazing examples of having strong faith through trials! Thank you for sharing. You are just amazing! And I love how honest you are...I am praying for you guys, during this happy and sad time. Looking forward to finding out what Baby Mac is. I am definitely praying for you guys. I know this new precious will make it easier in some ways but will also make it harder in others. But like you said God does not want us to live in fear. He loves us and wants us to be happy. God Bless You and Your family and this new precious baby. Just beautiful!!!!!! And praying that in 2010 with the arrival of this new miracle, that you will once again be restored with hope, peace, and joy as you go into the new year! Thank you for your honesty and for continueing to share your journey with us. Will be praying for you as you welcome Baby Mac! So glad I found your blog & I will definitly be praying for you both & this new baby.. Praying for peace & hope for you this New Year! Best wishes to you! Love the photo grid - you should print that as one print and frame it for the baby's room - so perfect! 1. Those 9 pictures are incredible. What a treasure!! 2. Dear friends of ours lost their baby girl just after Cora died and are expecting again. They made a short video of their story for our Christmas program, Hope. I think (know!) it will bless you. I hope that the new baby comes very soon and very easily , no one will forget Cora and how much she is missed . January 2nd will mark a year since my niece was still born , for those of us there she was a perfect little baby who didn't have a chance, to others she wasn't meant to be , but to us she was so very real and meant to be ,to those of us who held her and ached when we looked into her beautiful face and missed her cries and smiles and potential, the pain is so deep , for you mothers who have lost their little angels I ache for you . my sil is pregnant again too , it is a guarded hope and tempered excitement. I wish you a healthy and happy year ahead full of healing and blessings , I can not wait to hear the good news soon. One more thing , you are the most adorable pregnant girl , it sure looks good on you , loved that photo of you rockin the drums , so cute. Checking daily for updates on baby Mac(! )...can't wait for his/her arrival! Your faith is amazing and you inspire me so much. I will pray for you as Baby Mac enters your lives. Happy New Year to you all! I will be fervently praying! We will never forget Cora and we will always be praying for your hearts. New years baby??!! Thinking and praying always!!! You speak so honestly and truthfully, poignantly and beautifully. You are prayed for earnestly and frequently! May the Lord be with you during all of these changes, and may He uphold you during the weakest moments and give you delight at the most joyous ones. Look at that beautiful baby belly! Praying for the all the Macs, and anxious for news of his/her arrival! God bless! Praying so deeply for you and your whole family. Praying that the day this new little one arrives goes as smoothly as possible. Know that Gods grace is being shown in your lives and that His plan is perfect. Amen. I am praying for you guys right now! May this child come quickly and easily and in God's perfect timing and be a blessing to you both. Can't wait to hear about the arrival! Happy New Year! A New Year, full of life and change. I hope that the doctor has good news. And your new gift will be here soon! I absolutely love the belly pics. You have many people praying for you, rest assured. I do not pray, but you and Cora enter my thoughts daily. I admire your strength and look forward to news of the new baby's arrival! totally ramdom, but do you think that baby mac is a boy or girl? I have been praying for you as you miss Cora and anticipate the arrival of Baby Mac! 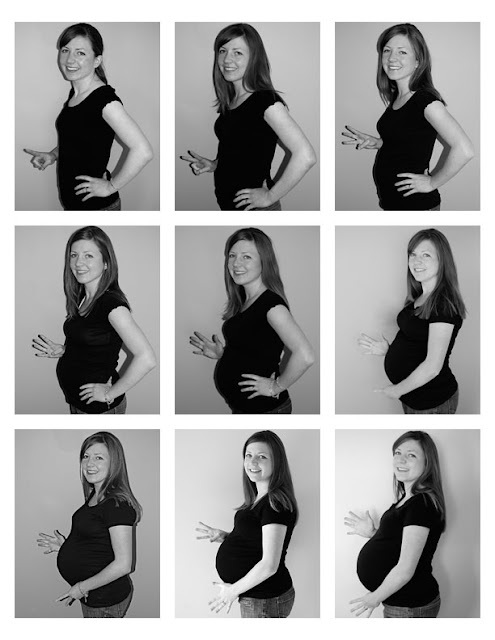 I love your picture collage- I hope to do that when I become pregnant. Thank you for reminding us of that Romans verse- it is so appropriate as we begin a new year!! Oh, I have already been praying for you and will continue to do so. I have shared your story with my husband. Everyday, I check to see if your little one has made his or her appearance yet :). Thank you for sharing your story with those of us who do not you in person. I have such a sense that His presence will be more real to you during this time than anything you have experienced in the past. Bless you, yours and this little one who is going to bring so much joy into your world. Can't wait for Baby Mac to make his/her entrance into this world and into the best mommy & daddy's arms! Wishing Cora was here to welcome her. She'll be throwing the greatest welcoming party in heaven - clapping and singing with the angels. Praying for your strength in these next few days and weeks and for all the emotions that will come with this next chapter. Love and hugs. So excited to hear your news! Hopefully soon! You are simply gorgeous when you are pregnant (and when you're not, too!) This little baby is already so, so blessed to be a part of your family. A baby couldn't ask for more! Hugs to you! Your words are so inspired and anointed by God. Thanks so much for sharing your story and opening your soul to us. You will never know the depths of how your story has impacted the life of my family. We don't take ourselves and the kids so seriously, we take time to enjoy the mundane...we laugh more. I got an email with a like to your blog early this year to pray for Cora and have been reading ever since but never commented. I had to today after reading your scripture. That exact verse is the reason I am a functioning mother of 4 today. After loosing a baby at 14 weeks, our next pregnancy (last one and unexpected) was filled with anxiety when my quad marker screen came back abnormal...until this verse was read as the sermon at our church the same week! I meditated on it 24/7, printed it several times and hung it all over our house. We had a healthy baby girl, middle name is Hope b/c of this verse. Will continue to pray for your family as you move forward and will pray for this baby from the top of his/her head to the soles of his/her feet, that every inch and every cell that makes up his/her body is covered by His blood! Will pray for your delivery too. Love your pictures, pregnancy definitely agrees with you. God Bless! Always thinking about and praying for you!! I understand the worrying about people thinking your "better" now because of new baby mac. We felt the same way when our daughter was born after our son died. Some people may never understand, but take heart in knowing that the few that do understand what your new normal is, are the one's that really matter! And take each moment one at a time- that's what is still helping us everyday. I'm praying for you!! Faithfully praying for your family during this exciting, yet emotional time in your lives. God is with you and has remained with you over this past year, he will always be by your side. I'm super excited to hear all about baby Mac's arrival and gender, and can't wait to see pictures of his/her sweet face! Much Love! Happy New Year! Your words are beautiful... Please know that we are praying for you in Alabama. Take Care! I love the pictures you've taken thoughout your pregnancy. It's fun to see them in order from beginning to almost there:) I am praying for you, Joel, and your new little one. I think of you so often. When is your due date? My first was 3 1/2 weeks early so I too thought (as did my doctor!) that my second would be early. No such luck...she came 1 day late! I'm sure you're getting uncomfortable...that last month is hard! I am excited to meet your new little one. Praying for you is part of my daily routine! Lately I have in fact been praying that you would be able to enjoy your new baby without fear. Hoping for a quick, painfree delivery for you!! We are praying for your sweet family. May you have a great delivery and healthy precious baby to welcome into your lives. We can't wait to hear about your new little one. Please bless Joel and Jess as they welcome baby Mac into this world. Thank you for giving them strength when you called Cora home. Please continue to to fill their lives with your spirit! I haven't commented very much, but I've been reading, praying, and feeling for you during this past year. I'm so excited to hear your news and see a little light shine in this dark time. May the New Year bring blessings of hope, love, joy, and comfort during this bittersweet time. God Bless! Don't know that I have commented before but I like have to check your blog every day. The waiting game is so hard and your writing today was so sweet. I know you will be a wonderful mom and dad to the new little mac just like you were with Cora. I admire your clinging to God and not becoming bitter with the nightmare of losing Cora. Your strength is amazing. Praying all goes well for you with your new little bundle. Definitely praying for you right now and in the days to come!!! I can hardly stand myself I'm so excited to see this precious new baby of yours. Hurry up Baby Mac! Praying for you as you wait for this sweet Baby Mac. I pray that God will surround you with his love. In March, I had my miracle baby after 6 years of secondary infertility and 2 back to back miscarriages. The pure JOY these last 9 months have brought are indescribable. I pray for you and your husband to have that joy tenfold. Praying for you in these last days of your pregnancy. Praying that God will give you the peace and joy to move forward in HIM with this new life in 2010. I pray for you and Joel SO SO much during this time. I can't wait to "meet" your little one! With prayers for you and your families. May Baby Mac come soon. We are checking in every morning in the hope for news. Thank you for reminding me, constantly, that God is in control and I just have to HOPE in him. God Bless you all from our little family in Australia. Wishing your sweet family a happy, blessed,and abundant New Year. You all will indeed continue to be in my prayers. what a cute way to show the progress of your pregnancy!! i love that! and i will be praying for your family as you go through the next few days, weeks, months. i can only imagine the emotional roller coaster you must on right now. i lost my brother in jr. high and was so thankful to know my God was with me through it all. it doesn't make things instantly better, but gives you a peace i'd never know otherwise. i look forward to seeing photos of your newest family member, hopefully soon! I am so glad that I stumbled across your blog in 2009. It was just a few months after Cora had gone on to heaven. It has been a blessing for me to pray for y'all as you travel this journey of grief and happiness. I've kept checking the blog feed a couple times a day to see if Baby Mac has arrived yet. Can hardly wait to watch you take this next step of welcoming your second baby into this world! You continue to inspire me with your grace and strength. We're definitely praying for you up here in British Columbia, Canada, as you welcome Baby Mac into your wonderful family. Happy New Year to you all! your blog is an incredible encouragement to me. I've followed for a while and am inspired by each post. Your hope in the Lord is steadfast and His strength shines through you brightly. In our pain of loss I have learned that our God is a GOOD God and I'm going to obey and see goodness in the choices He has for me. His goodness is bright in your life and He is walking faithfully beside you. Many blessings to your growing family. May your birth be beautiful, perfect, and joyful. May this baby be an incredible blessing to you and the Lord give you balance in your emotions in the days and weeks following your birth. I look forward to hearing of the great joy the Lord has for you. I am praying right now for you and your family. Looking forward to seeing Baby Mac! Best wishes! Praying for a swift and safe delivery and for your emotions as you welcome your new one. I am praying Jess..you guys are brought to my mind often! thinking you Jess, and hoping for good news very soon. What fun pics! Love those belly shots. Praying for you still. 2010 is sure to be a very blessed year for your family. I love the way you express your emotions. I've never been through what you have, but you have this way of writing, that makes it easy to come alongside and sympathize and even pray with more of an understanding spirit. I cannot wait to see pictures of you guys holding another precious baby in your arms. I imagine every single time you hold or kiss your new little one, memories of Cora will come flooding back... forever. I doubt it will change. Its one of the ways her memory will live on with you. Praying for a safe delivery and healthy baby! I love how you documented the past 9 months in those pictures. It will be something new baby Mac will love when he/she gets older! I pray for you and your husband. I know God will help you two thru this and you will love this baby so much! This baby is a blessing and I hope the delivery is quick, easy, and goes smoothly! God Bless yoU! Praying for you guys and can't wait to see pictures of the new baby! Hope you will post promptly!! :) Good luck in delivery. Sending lots of prayers for peace, continued strength, hope, and so much more. Cora will be looking over her brother/sister from above and she will never be forgotten. I have no doubt you'll continue to keep her in your lives each and every day. You are both so strong. This is ridiculous, but not even knowing you, I am so excited to hear of the news of baby's arrival (and I am getting impatient,even more ridiculous, so can only imagine your anticipation level). I was certain you'd made a DIY Christmas gift....I suppose baby could be an Epiphany gift, that would still count as Christmas, right? All that I am certain of is that God's plan is not ours to understand and His is perfect timing. Babbling along, trying to say, I am sitting in the pacific northwest saying my prayers for you along with everyone else. To put it simply you are an inspiration. Reading your blog helps me to appreciate EVERYTHING that I am blessed to have, so... THANK YOU!!! Best wishes for baby Mac and Good Luck!!!!! Like so many others, I have been praying for you, about the very thing you mention in this post. I pray that the God of peace and hope is so present and real in your lives right now, and that you are able to be joyful as you anticipate the arrival of your new little Mac. Your words are so amazing and wonderful...and a true testimony to God's grace. May he continue to heal and answer. I have been reading your blog for a while. I think of you often and keep you in my prayers. You are an inspiration to me in ways you will never know. I love your love for Christ and your steadfast faith. Your beautiful pictures and crafts inspire me as well. Thank you for sharing your story. You are a beautiful woman, inside and out. I love your belly shots your so creative! I cant wait to hear about the birth of baby mac I keep checking back every day. Hold your new little one close knowing that there are hundreds probably thousands out there praying for you and Joel and baby mac. I've been checking your blog every day lately, waiting for new of Baby Mac's arrival... hoping for a smooth and easy delivery for you! I've been reading your blog since just after Cora went to Heaven... your testimony and honesty is truly God-honoring. May 2010 be a year of joy and hope and continued healing for your hearts. I want to say what an encouragement you are to me...I stop in here and read and always leave feeling such a sense of peace. I am praying for you... thru your tears and thru your joy in welcoming a new little one into your hearts and home. May God do exceedingly more than you can ask or imagine in this new year. I look forward to hearing your baby news...God bless you and your husband and Baby Mac too. Congratulations! I just heard the news of your new little one! My prayers are with you in this new journey. Congratulations. We just heard the good news about your new son. We are happy for this new blessing for your family. Sending prayers your way and wishing you a quick labor can't wait to see the new baby mac but Cora is never far from my mind. Your strength and faith has really showed me so much about myself and guided me back to teh Lord. May God continue to watch over you and bless your family. Excitedly awaiting the official announcement!!!! Macs--- that 9-shot picture is absolutely amazing! What a beautiful (yes, YOU!) image of this amazing transformation over these last 9 months! Never seen anything like it before! Oh my goodness, what a precious blessing! I have been following your blog from time to time for a long time and I've prayed for you through many of your difficult days. My deear, I am praying a prayer of thanksgiving today, as you celebrate the brand new year with a brand new beginning! Nothing can replace sweet Cora, but Levi will provide you all with many tears of JOY! God bless your sweet family. I really think it should have been up to Jessica to post any announcements. It is her/their news to announce, afterall. I follow your blog almost every day. I just wanted to send more thoughts and prayers your way as you welcome a new part of you into this world. I know you will always feel with Cora not here that a part of you is gone, but I'm so glad you are being blessed with Baby Mac to help bring joy to your lives. I can't wait to hear the big announcement that Baby Mac is here. Cora will surely be his/her angel 24/7. Just relax and enjoy each and every precious moment up until the birth and after! Congratulations! You guys are angels and Cora is an angel too. Olá, conheci teu blog e amei! Que o Senhor Deus continue te conduzindo ao crescimento na graça a no seu amor.